Today started with a visit to the hospital with my hubby for his check up. I’m pleased to say it all went well, although he wasn’t convinced the nurse had left him enough blood after she had finished filling 10 different phials with the red liquid she drained out of his arm! I was enjoying a successful afternoon in my studio, planning two new videos when, horror of horrors, I spilt a jar of black embossing powder all down my front, onto my chair and the floor. I called out in a panic to hubby who came chasing upstairs two at a time to find out what disaster had befallen me! He tried not to laugh at me but I could see his eyes were laughing……………….always such a giveaway with him! He went downstairs, one at a time, and came back up with the vacuum cleaner. I’m pleased to say it didn’t take long to get all the powder vacuumed up. I hope I managed to save enough for my two videos tomorrow! 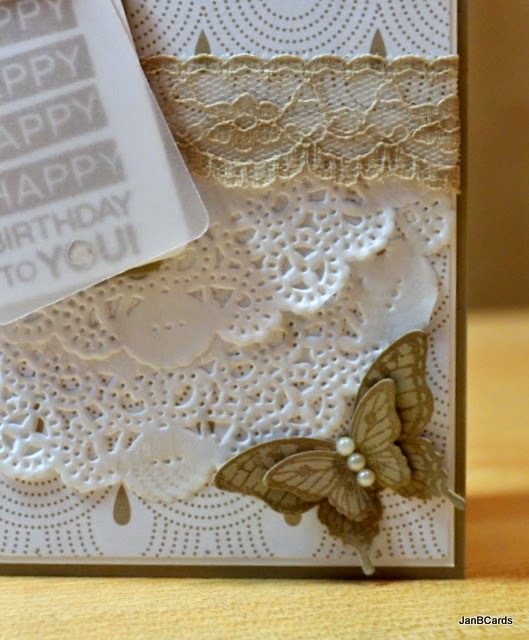 In the morning, I shall be posting my next video which I have called Something Borrowed Doily Card. As always, I have posted a sneak peak here for you.